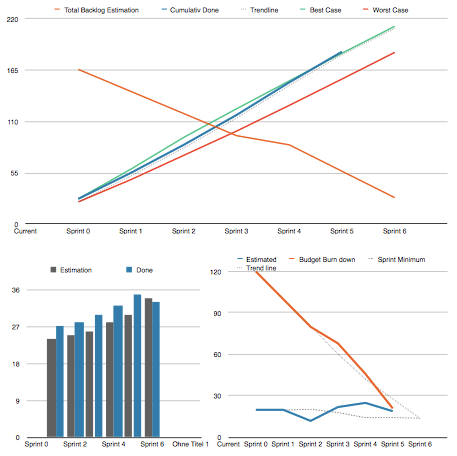 [WAI•O•BLUE] Acceleration•CompetenceBlog-enForecasting in agile Projects - Do you get your things done within time and budget? Forecasting in agile Projects - Do you get your things done within time and budget? Well, this sound like a question for classic approaches J. However, I often get asked how could we know in agile projects, or on product level if we get things done in time? Agile projects are cool and simple, planning is sprint by sprint and team size defines monthly budget. 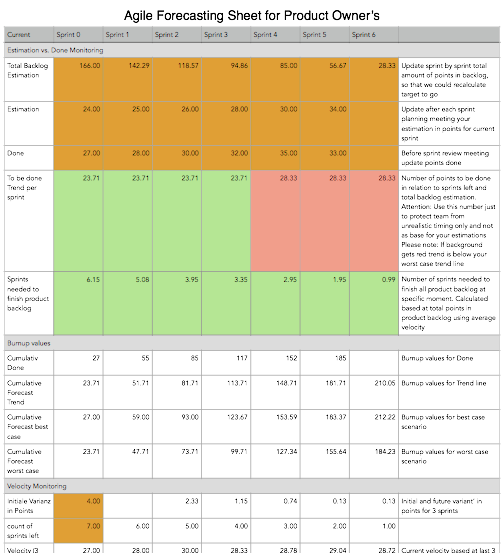 However, if you’re a product owner you might be asked by your stakeholders and sponsors "what of the product backlog could be done until when", "what does it cost" and most difficult "are we still on track"?-As usually just sprints are under deep monitoring I’d like to share with you a very simple instrument, the product burn up chart. While creating these graphs I started to play around with some scenario’s and I found out that this is getting more and more complex. E.g. it might be interesting to monitor development of product backlog size as well. In my scenario the product would be implemented within 6 sprints and additional stories would be rarely added. However in corresponding data sheet I’ve added some notifications if it gets unrealistic to stay within time and budget. Furthermore over time the best/worst case forecasts are getting more and more accurate. In my example the team is performing very well, since sprint 4 near best case scenario. My calculations might have still some bugs, so I do not guarantee nothing. I’m curious about your input about, may be we could develop it more and somebody creates a standard plugin for Atlassian Agile? I pass any monitoring of outcome like end user feedbacks, increasing of revenue, etc. at this moment. Is your proposal as lean as your agile contract? Is your Strategy AGILE enough? Are today’s Product Manager Agile enough?